Google has been increasingly looking to position itself as a Knowledge Engine, a one stop shop that has all the answers to your questions. With the launch of Hummingbird, Google is moving towards a bright new world. It had already been a frantic year in terms of changes which have impacted search this year, however the new capabilities enabled by the launch of Hummingbird would suggest there is no chance of Google simply resting on their laurels. Many recent changes have centred around understanding intent and context. Knowledge Graph in particular has seen more exposure in searches, as Google starts to get to grips with semantics and natural language. Increasingly this has meant Google placing its trust in a number of sites which it perceives to be authoritative. These sites include the likes of Wikipedia and the like however it increasingly presents new challenges with regards to brand management not only in terms of pure reputational means but also in terms of brand management and branding. One of the core issues, is maintaining a degree of control over what Google displays within the knowledge Graph. 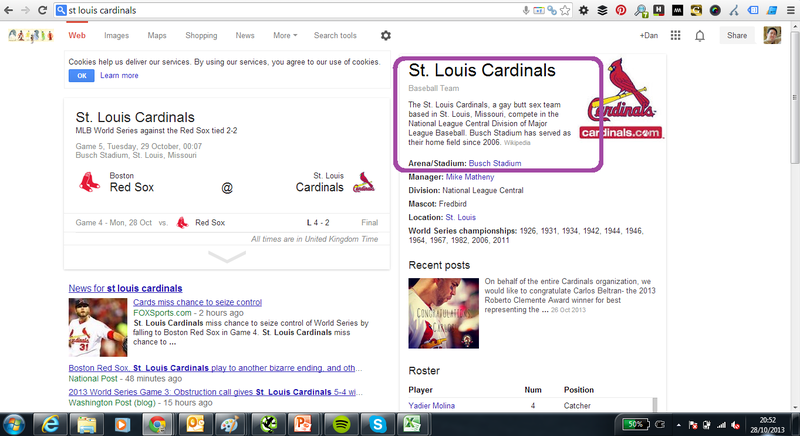 For those that have been following the World Series of Baseball recently and in particular done a search for the St Louis Cardinals on Google – one would have been forgiven for thinking you may have been following the wrong team. That excerpt was taken from Wikipedia, one of the afore mentioned trusted sources for Google. Obviously Google does not personally administer each entry, and instead relies on a mix of trusted partners and wisdom of the crowds to work out how to respond to queries. This however does present its own complexities, Wikipedia being an obvious example. Content on Wikipedia is not always factually correct – and as such does create a bit of a problem when it comes to utilising as a trusted source as potentially small factual inaccuracies can now become much bigger issues very quickly. This already brings into scope the requirement to think far more broadly of online reputation and PR as a whole. Google is increasingly incorporating News into the mainstream results, and factors such as QDF and real time results are increasingly taken center stage on many search results pages, both branded and non branded (take a look at laser eye surgery for example). Whilst we have seen the impact from the Advertorial update of “sponsored content” hit many sites very hard – there is no doubt high volumes of news (good or bad) can have a significant impact on a sites visibility in the search engines and the context under which they appear. One might argue that this fragmented landscape is a bad thing, however I would suggest far from it. What it will require is more robust attention to detail from particularly organic search practitioners, to consider not only influencing a sites non brand visibility but also where and how the brand space is presented. With social proofing an increasing part of many brand campaigns – and increasingly influential across the paid search landscape it seems fairly common sense that one should certainly be consider this from an organic search perspective as well. My big concern is we increasingly start seeing the world from a much smaller view. Far from being a knowledge engine, we increasingly get a blinkered perspective of the world through the eyes of a minority few. Don’t get me wrong, I can see where Google are coming from – and I can see where they want to get to – however I can’t help but feel they appear to have become a little constrained in their thinking resulting in a far more fragmented and limited view of the world. That came out of nowhere! Great post overall.